Ethiopian government officials this week celebrated the diversion of the Blue Nile river for what they’ve dubbed the Great Ethiopian Renaissance Dam which is expected to provide hydroelectricity for Ethiopia and neighboring countries by 2015. But downstream nations Egypt and Sudan are troubled by the huge hydropower dam going up on the Sudanese border. Planning stages of the project were shrouded in secrecy, much to the alarm of regional governments, Nile planning agencies and Ethiopia’s Western donors. There was no expert analysis that would normally accompany such a titanic project, remarked Sudanese hydrologist Haydar Yousif. “No environmental assessment is publicly available for the project. And no steps were taken before its launch to openly discuss the dam’s impacts with downstream Nile neighbors Egypt and Sudan,” he said. Further, the dam is in a quake zone and could be at risk from damage by earthquakes, yet no one knows if it has even been analysed for this risk. The failure of such a huge structure puts the more than 100 million people living downstream at risk. 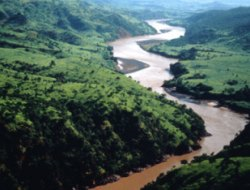 “Whatever the outcome of political arbitration, it remains irresponsible for Ethiopia to build Africa’s biggest hydropower project, on its most contentious river, with no public access to critical information about the dam’s impacts – a flawed process which can hardly result in a sustainable project,” said Yousif. Leave it to the Democrats!